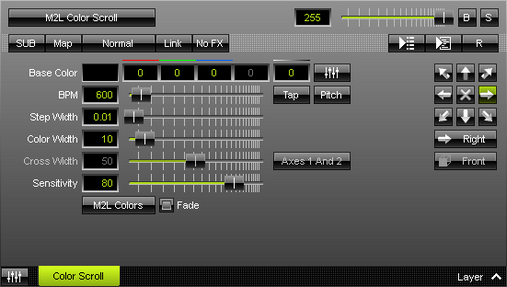 M2L Color Scroll displays moving colors based on the incoming audio. ▪ Color Width - Defines the minimum width of a single color [in %]. The default value is 10. Valid values range from 0.01 to 100. ▪ Sensitivity - Defines how accurately MADRIX reacts when notes occur [in %] or if notes are filtered out. The default value is 80. Valid values range from 0 to 100.